Between them, Sylvester Stallone and Arnold Schwarzenegger have appeared in enough of each by this point to know what separates an action movie from being a hit or bomb. 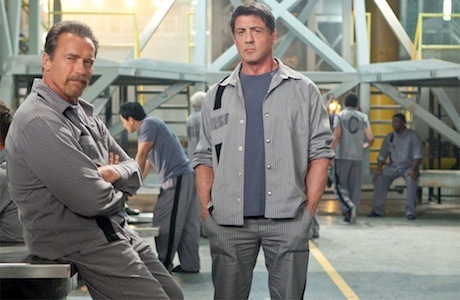 Combining forces for the first time in Escape Plan (Arnie's cameo in The Expendables notwithstanding), the duo wisely recognize the limitations, not to mention credibility, of performing too many incredible physical feats at their age and have lent their marquee names and talents to a project that instead emphasizes brains over brawn. Stallone is Ray Breslin, a security specialist who literally wrote the book on fortifying prisons by spending the last seven years getting paid by the government to become incarcerated in various penitentiaries under false identities and then breaking out. When we first meet him, he's using his acumen to escape from a Colorado facility, before meeting up with his team, consisting of a partner (Vincent D'Onofrio), a tech wizard (50 Cent, naturally) and a cursory love interest (Amy Ryan). They're presented with an especially lucrative but proportionately risky proposition to test a privately funded high-tech prison with vertically stacked cells and masked guards. It's run by Hobbes (Jim Caviezel), an effete taskmaster who turns out to have no knowledge of Breslin's real identity or purpose of being there, and gleefully announces that he has no intentions of ever releasing him. With the help of a burly fellow inmate, Rottmayer (Schwarzenegger), Breslin begins to put a plan together to get them both out of there. There's great fun to be had in simply watching the two action titans play off of each other, as in a light-hearted scene where they assign nicknames to guards based on how they walk or resemble girlfriends they used to have. Stallone's well-established, taciturn presence is enough to have us invest in him without the estranged family backstory the screenplay insists upon, as his much-parodied voice has been refined to such a varied selection of expressive grunts that they put heir apparent Vin Diesel to shame. Schwarzenegger is relegated mostly to a sidekick role, but he uses the opportunity to inject some humour into the margins and provide a necessary diversion for Breslin, when called for. Not everything works along the way, as Sam Neill is stuck with a thankless role as a doctor who slowly becomes aware that he's one of the bad guys, while director Mikael Hafstrom has a tendency of marring action scenes by filming them so close that what appears kinetically exciting often only ends up being disorienting. It's hard to nitpick too much about the details of a lively prison break movie like this though, especially when there's Vinnie Jones showing why he should be appointed lead henchman for every villain.